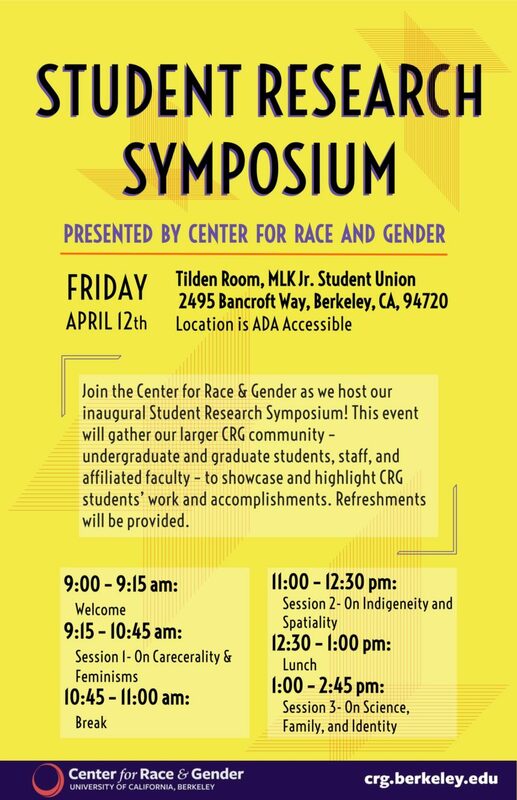 Join the Center for Race & Gender as we host our inaugural Student Research Symposium! This event will gather our larger CRG community – undergraduate and graduate students, staff, and affiliated faculty – to show case and highlight CRG students’ work and accomplishments. Faculty and graduate students are welcome to submit proposals to present at the CRG Thursday Forum Series. Proposals to present as an individual or a panel are invited each semester. about proposal deadlines, download proposal forms, and check out the latest upcoming forums. © 2019 UCB Center for Race & Gender.